Television has a well-documented diversity problem when it comes to writing staffs—especially when it comes to race. But if anything, the problem is even bigger when it comes to who actually directs episodes. Over in Variety, Maureen Ryan has created a devastatingly well-researched and in-depth report about diversity behind the camera on television. Anybody who cares about seeing a variety of perspectives reflected on TV—or really, anybody who cares about television being a medium that reflects the world we live in and presents interesting stories about real people on this planet—should read the whole damn thing. The charts above come from one of the articles, and they’re just a selection of the data for a ton of TV networks that Ryan presents. 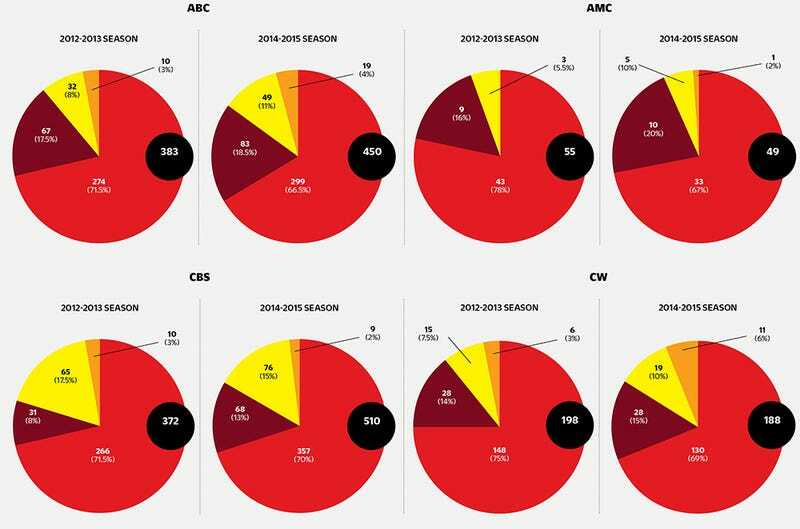 In those charts, the red section represents white male directors, maroon is white females, yellow is non-white male, and orange is non-white female. In other words, most TV networks are barely employing people of color, and especially women of color, as directors. Among other things, Ryan’s report reveals a huge unevenness from network to network, and show to show—with “prestige” cable TV shows lagging behind in terms of promoting directors of color. On Twitter, she recently pointed out that if she or another director of Arab descent had gotten a chance to direct “Homeland,” perhaps graffiti in Arabic mocking the show would not have appeared in a recent episode. There is tons of information and insight as to the barriers that keep people from taking a chance on new (and more diverse) directors. One of the biggest problems? The job of hiring a director is often in the hands of showrunners—who are under the gun and hire people they already know.